The last reservation of this item will conclude on April 24. For rentals that require shipping or a pickup at a non-headquarter location, please select a later date for your arrival. Headquarter offices are the only locations that can accept a same-day reservation, as transit time is not calculated in this date. 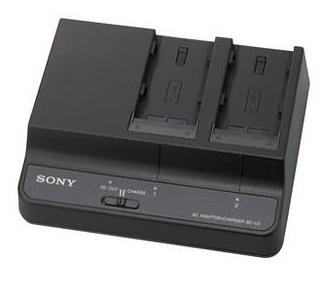 The Sony BC-U2 Battery Charger can charge two Sony BP-U30 or BP-U60 batteries at once and also doubles as an AC power adapter for the Sony PMW-EX1 camcorder. It also includes a charge status indicator to assist with gauging battery charge levels. This charger is only compatible with the Sony BC-U30 and the Sony BP-U60 batteries.